Which Suzuki is right for me? Which statement describes your dream holiday? Backpacking through Europe. I love the arts and culture scene, and my dream holiday involves sipping cappuccinos in boutique cafes and visiting historical landmarks. A romantic weekend getaway with my partner (while granny watches the kids). It’s a toss up between a cruise to the Arctic or cave diving in Bermuda. I never do the same thing twice, and have an extensive bucket list. New York, New York. I’m a jet-setting, city slicker who dreams of the Big Apple. Local is lekker! I’m in my element road tripping to Durbs with a group of my best friends. A family cruise to an exotic destination, which offers fun activities for the whole family, but also gives me some much needed alone time. A camping trip to the Kruger National Park. There’s nothing better than spending time with the family in the great outdoors, away from 101 screens. A week in Thailand or Bali. I love a good beach holiday, as long as it’s in a new and exotic destination. I’m a savvy shopper who looks for versatility in the products that I buy. I’m conscious about the way my car looks but still look at safety and reliability. I’m a family focussed individual who wants value for money and peace of mind when purchasing. I’m a budget conscious individual who enjoys a quality product. I’m an individual and want to feel that even though I’m part of the crowd, my choices are unique to my style and lifestyle. I want to treat myself to a big car that I love. I’m a parent who enjoys spending time with family making memories and enjoying experiences in nature. I’m an adventurous thrill seeker who loves to explore. I’m go getter and want products that that enable my willingness to explore. What do you need most in a car? I want a car that I really love that can handle lots of family road trips out of the city, and doesn’t cost me a fortune. I want a small, reliable car that suits my personality and lifestyle but is still economical. I want a sleek, sporty car that looks as good as it feels to drive. I want a car that’s big enough for my whole family without breaking the bank. It needs space for kiddies car seats, prams and toys. I want a car that can keep up with my adventurous lifestyle. I want a car that fits in with my active lifestyle, accommodates family travel and is fun to drive. I want a car that I can customise to suit my unique style without having to spend a fortune. I want a car that’s easy on my budget without compromising on style. Which statements best describes your driving habits? I’m always on the go, so spend a lot of time in my car. After work I often pop past the gym for training, and meet up with my friends. I do a lot of urban driving, and on weekends I do my fair share of rural driving outside of the city. I usually have my family and pets along for the ride. I spend all of my free time off the beaten track, and do loads of off-road driving over various terrains. I often have my young children in the car with me, and need to know that they are safe and comfortable. I don’t often drive long distances but make two to three trips around my area daily, mostly in suburban traffic. I often have my family and friends with me. I feel more comfortable driving a slightly larger vehicle, but do a lot of city driving and still need the economy of a small car. I spend a lot of time in traffic and need a zippy little car that can slot into tiny parallel parkings in town. I do mostly urban driving. Style and fuel efficiency are extremely important to me as I like the best of both worlds. Dynamite comes in small packages. Just like the Celerio, you understand that it’s the simple things that add colour to our lives. You have a bubbly personality and know how to have fun, but you’re also well grounded and know what you want from life. You’re a quirky individual who stands out from a crowd. Just like the Ignis, you have a bold personality and turn heads wherever you go. You’re always ahead of the trends, and don’t believe in doing things just because everyone “else is doing it”. You have a caring and responsible personality. Just like the Ciaz, you enjoy the finer things in life - as long as they don’t play havoc with your budget. You’re working hard to build a comfortable lifestyle for your family, which gives you complete financial freedom and peace of mind. You’re loving and kind, and always put others first. Just like the Ertiga, you’re practical and well grounded, and your heart has room for all those you hold dear. You’re selfless nature keeps you on your toes, and you’re always running around making sure that your friends and family are safe and happy. You’re fun loving, hard working and successful. You can be serious when you need to be, but you know how to let your hair down on the weekends, and have a great time. Just like the Vitara and the Grand Vitara, you’ve worked your way to the top. You have a strong personality and are able to handle whatever life throws your way. You enjoy nothing more than spending quality time with those you love and have an adventurous streak that often takes you off the beaten track. You’re a socialite and a fashionista and you know it! Just like the Swift, you’re well loved and respected, and known amongst your peers for your unbeatable style. You’ve got a lot on your plate - but that’s just the way you like it. You take pride in being independent, and you’re not afraid to create your own path in life. You’re an adventurous, free spirit that cannot be tamed. Just like the Jimny, you go wherever you want, whenever you want and have few ties to the material world. Your dream is to travel as often as possible and to experience life to the fullest. You live simply, but you live well and you’re happiest when you’re outdoors challenging mother nature. You’re stylish and tech savvy. Just like the Baleno, you enjoy a fast-paced lifestyle but also appreciate the finer things in life. You make looking good look easy - you’re fashion conscious, but don’t follow every trend. You’re a go-getter and are driven to achieve everything you set your mind to. Trying to decide what type of car will fit in with your lifestyle? 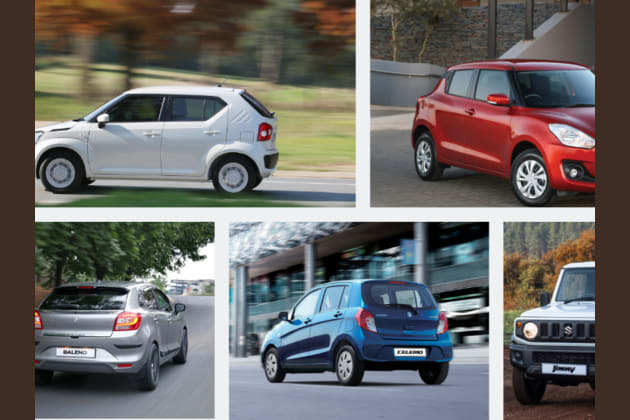 Take this short quiz to find out which car matches your personality.